Bacolod Normal: Manila "Very Traffic" Bacolod Normal: Manila "Very Traffic"
We, Zabrina and I, just got home to Bacolod after three days, two nights in Manila. We went there as my sister and friend arrived from England on their first ever visit to the Philippines. Naturally, I was delighted to see my sister and we now have over two weeks together to show her the “sights” on Negros Island and slightly further afield. We plan to go to Mambukal, DS Benedicto, Sipalay and Boracay to just name a few places. It was both interesting and amusing to hear and observe my sister and her friend’s reaction to witnessing the chaotic traffic in Manila. The “oohs” and “aahs” were so funny as they witnessed the usual antics displayed by the typical Filipino driver in Manila. It also served as a reminder to me to show how much I have become accustomed to Filipino driving and traffic. 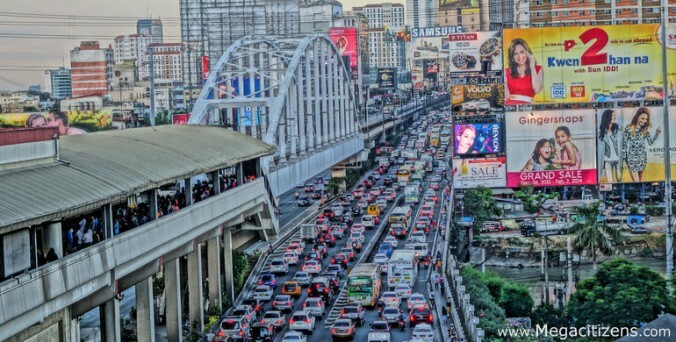 I had previously written about my first impressions of traffic culture in the Philippines here and here. The overall impression is one of traffic chaos. However, it is a species of organized chaos. It works most of the time! The worst aspect by far is the smoke-belching jeepneys. How they ever pass an emission test is beyond me can only be possible by means of corruption. That strikes me as being unfair on the better maintained jeepneys that do not belch out a poisonous mix of fumes. So why is there no enforcement regime in place to ensure less air pollution? The other two major issues apply both in Manila and Bacolod. Why, oh why, do vehicles drive too close to each other? The inherent dangers of that are obvious. Secondly, why do drivers insist on blocking intersections when the traffic is stationary in front of them? They cannot move forward, so why not allow that traffic to the left and right at an intersection pass freely? I’m not sure I will ever hear any kind of explanation for that! One of the Manila sights connected to traffic and pollution that my sister and her friend commented upon was the street sellers. The ones that stand in the underpasses selling their wares. They stand between the lines of choked, stationary traffic moving from car to car in an attempt to earn a few pesos to feed a family. All the time, constantly gulping in great gobs of carbon monoxide, and goodness knows what other crap, in the cocktail of poison emitted from all those vehicles, engines running but going nowhere fast! This sight typifies the nature of most hard working Filipinos. They are prepared to work hard to feed their families even in the most perilous places. I admire them and of course, it is so much better than resorting to stealing or scamming people. Yet despite the traffic problems, Manila is a wonderful city. One of our stops in our short stay there was the City of Dreams. Usually, I am no fan of malls but this is an upmarket mall with a difference. It is relaxing! There is stuff there for all ages including the Dreamworks attraction with Shrek and the Lion King featured in there, and a casino. It has many upmarket retail outlets such as Bulgari, plus a food court with some pleasantly inexpensive alternative choices of cuisines. We chose to eat in the Red Ginger, which serves Indonesian cuisine and it was excellent! I had the most wonderful Angus Beef Rendang – a classic Indonesian dish of beef stewed in coconut oil and chili gravy. It was not only tasty but came as a massive portion, as was the portion of rice that accompanied it. The service is top class and the servers were all extremely pleasant and very professional. My sister and her friend also enjoyed our trip to Tagaytay. It’s up in the mountains and such a refreshing cool breeze compared to the heat and humidity of Manila. We took them to the Residence Inn for lunch, a place we have visited before, and were not disappointed. The food there is excellent, especially the specialty bulalo, a healthy stew. I love that dish! The deck restaurant overlooks the volcano and Lake Taal and it is such a great view. There is a small zoo there complete with tigers and a crocodile as well as many other animals. There is also an aviary too with a collection of owls and even an eagle! The Tagaytay Highlands is a great place for a day trip out of Manila and is about 55 kms south of the city. But be warned, it becomes heavily congested at weekends and holidays. It’s good to be back in Bacolod, the City of Smiles. After the frenetic activity of Manila, it is so good to come home to the laid-back Negrense atmosphere! PS confession time! I didn’t do my own driving in Manila. So I must thank and pay homage to Mark, our driver, who was not only a safe driver but a great guy too! My book is now available for download at Amazon. I’ve like every Indonesian dish I’ve ever had; some interesting overlaps with Thai food (e.g., coconut-based ingredients). I’m with you Adam. I love both Indonesian and Thai food but Indonesian isn’t usually as fiercely spicy as most “real” Thai dishes.